Do all your different usernames and passwords drive you crazy? I for one, forget mine all the time! It's so annoying. Wouldn't it be easier if there was only one network that you could use for everything? From social media accounts to messageboards etc. One network, one username, one password, one person? In Dave Egger's book The Circle that's a reality! The Circle is this big innovative company that wants to make the world a better place. And one of their inventions is TruYou. A system that allows you to use all the facilities you like with only one personal account. In The Circle we meet Mae Holland. Mae is over the moon! Because she got a job at The Circle. And The Circle isn't just any other company. It's where the most creative and bright people of the world gather and work together. Who wouldn't want to be a part of that? Through Mae we get to know The Circle. We learn how it works, and what's important. Everything in The Circle is connected. People are constantly connected. In fact, it's mandatory to be online and connect. Something Mae soon finds out, because at first she doesn't realize hów important it is to connect. Once she does, she throws herself heart and soul into living up to the expectations of The Circle. Slowly but surely Mae becomes one of them. But as a reader you can't help but feel concerned for Mae. Because is her total absorption in The Circle a good thing if she stops doing things she used to love? And her relationship with her parents deteriorates? The Circle: great inventions but at what cost? On the one hand the ideas and inventions of The Circle are great. Like cheap little cameras that no one can see. Anyone can buy them and put them somewhere. The idea is that this will stop criminal behavior. After all: who's going to rob a bank, if he may be caught on camera?! And how about politicians wearing a camera around their neck 24/7? Policiticans go 'transparent'. But all these ideas come at a great cost: total loss of privacy. Because according to The Circle, privacy is stealing experience and information from others! And sharing = caring. So if you don't share everything you see or do, you obviously don't care about others, and you're self centered. 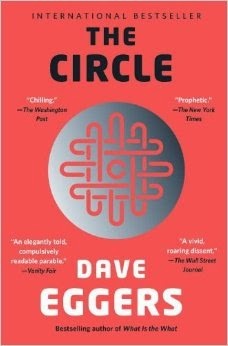 The Circle is a so called dystopian novel. But because The Circle sounds a lot like Google, and the importance of being online makes you think of Facebook, the future in The Circle seems a bit too close for comfort! If definitely made me stop and think about how I use social media. I liked Mae. But I would have liked to have gotten some more insight into her character. I kept thinking she would see The Circle for what it was. A scary regime. The Circle is a very well written book. And it's got great ideas. Apart from that it makes you stop and think about where the world is heading. Google is getting more powerful every day. Is that something we want? Or should we be scared?! Hum this gives pause for thought thats for sure. We have to be careful these days with the info that is shared online, due to the identity theft. Thanks for sharing on Oh My Heartsie Girl!! !